A pair of electronic glasses have been developed by neuroscientists at Oxford University that allow visually impaired wearers to see once again. Not literally. But these glasses could help many people navigate their way with ease. Video cameras mounted on the corners of the frames build up a three dimensional, or stereoscopic view of what is in front of you. 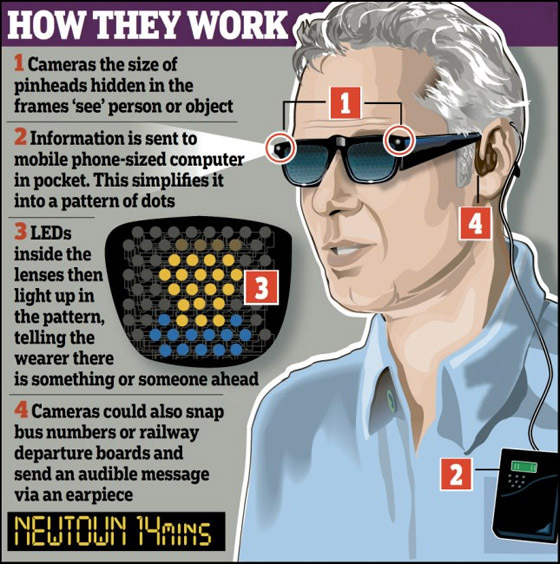 This is then translated as simple patterns accross a grid of LEDs on the glasses' transparent lenses, with nearer objects being signalled by brighter lights. A prototype, which also uses infrared technology from the Xbox Kinect to detect objects in low light conditions is in its early stages. In the long run, lead researcher Dr. Stephen Hicks believes the glasses could be manufactured for around £500 a pair. [Note: In an article posted by MailOnline in 2011, the glasses were tagged to cost less than £1,000]. Dr. Hicks said that what made these image recognition glasses possible was the development of sufficiently powerful and portable computer technology. Technology does help us in our daily affairs and in this case, our visually impaired friends and kins. Many thanks to never ending endeavor of ordinary people around us! This is remarkable technology! My husband has always had poor eyesight. Last week he had two cataracts removed and new lenses put in his eyes. He can see perfectly now for the first time ever. I can't tell you what a joy it has been to watch him discover a whole new world of light and color. Yes, thank you technology. I'm in awe! How fast would you have to run to "walk on water"
Day 28, United go top! 20 MW Apple's NC Solar Farm?